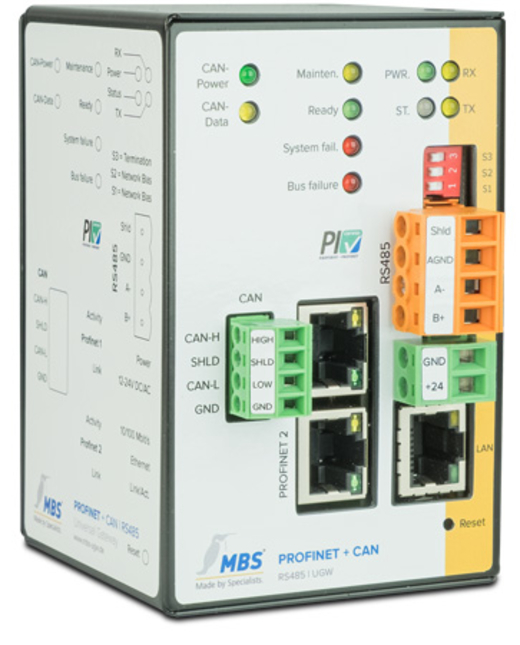 The integrated Profinet+CAN-adapter make the usual external bus couplers unnecessary, reducing the amount of wiring required and enabling faster connection to serial or network-based communication protocols. With its numerous available communication protocols the Profinet+CAN Gateway offers for nearly every requirement the right solution. On request, proprietary protocols can be implemented. The configuration of the Profinet+CAN gateway will be done with text files, these are transferred on an integrated webserver via a browser on the gateway - the configuration is permanently saving on the gateway - optionally as backup in a Dropbox (requires Internet connection).